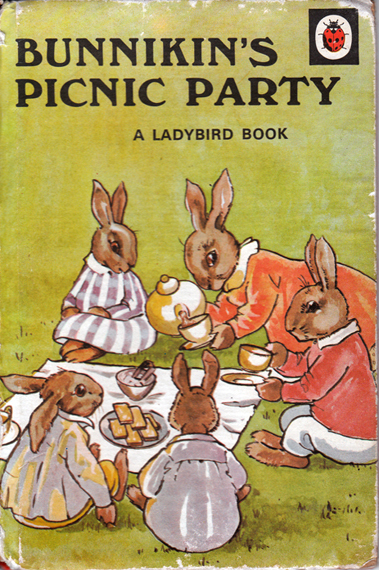 Description: The first title in Series 401 is the delightful story, told in verse, of Bunnikin and his brothers and sisters spending the day in the woods and the adventures they have. Lovely, full-page colour illustrations on each facing page. Matt pictorial boards worn along edges. Spine in poor condition: rubbed, creased; 1 cm missing from head; slight damage at tail. Corners bumped and rubbed. Neat gift inscription in blue ballpoint on flyleaf. Title-page and flyleaf creased; minor stain on latter. All other pages are in very good condition: crisp, clean, bright, and tightly bound. The only year given is 1940, but this reprint dates from c.1978.